Igor Ljubuncic of Dedoimedo published his review of the Plasma 5.12 beta recently. As always, he’s very thorough, and points out out issues that keep Plasma from being A+ quality. A major part of our Usability and Productivity initiative is honestly acknowledging user feedback and criticism with humility instead of defensiveness or dismissal. That way, rather than engaging in pointless arguments, we can focus on fixing problems! Default bottom panel isn’t optimal for using a global menu: this is true, but since the global menu isn’t shown by default, I think it’s fair that if you’re going to use it, you’ll need to change the UI a bit. This is why Plasma is so customizable! Global menu only works in certain programs (e.g. not in LibreOffice or Steamc): it’s unfortunately not something we can fix; this is up to the distros and app developers. Ubuntu’s former Unity global menu feature worked for all apps because Canonical patched the software they packaged to make it work. System Settings window opens too narrow by default: (KDE bug 389617). A trivial change. Will be fixed soon. Sidebar headers are too light: (KDE bug 384638). Not a bad design decision, but rather a a bug caused by the choice of implementation. Slight RGB hinting font anti-aliasing not used by default, even though that’s the best setting: (KDE bug 389598). We may be able to change the defaults here to improve things for the majority of our users. Default font size should be slightly larger with Noto Sans: a controversial proposal, but might be worth it. I plan on doing some side-by-side testing for this. Get Hot New Stuff never seems to works right and is full of outdated content: unfortunately, this is true. It’s a major pain point for a lot of people that we’re aware of and planning to put some work into. Dragging a URL from Firefox to an Icons-Only Task Manager doesn’t work: (KDE bug 389613). Worth mentioning that this mostly works with a regular task manager if you drag it to the region that holds app launchers, not the window list part. Panel resize UI should have a text box/spinbox to choose the height: (KDE bug 372364). There’s a patch currently undergoing the review process that makes this better! Spectacle’s “Save As…” option should be more discoverable: (KDE bug 389614). Trivial fix; will be done soon. Discover app pages look sparse: not our fault, this is entirely on app developers and Ubuntu 16.04 (or KDE Neon, depending on your perspective). Discover’s settings page has a scrollbar that overlaps interactive UI elements: (KDE bug 389602). A clear bug; will likely be fixed soon. Discover’s settings/sources page is confusing and exhibits poor usability: Mostly true for distros that have a lot of repos, but a legitimate criticism. We’re discussing this internally. Discover doesn’t offer a way to install NVIDIA drivers or other similar things: Discover is an app store, not a driver manager or a package manager, but we’ll see if there’s any way we can improve this. Dolphin should add Places panel entries for Documents, Download, Pictures, and Music: (KDE bug 389618). A simple enough change, though I think it may take some doing to avoid introducing duplicate entries for existing users. Support for smartphones (especially iPhones) is spotty: A known issue. We’re working on it, slowly. Copying files to samba shared resets their timestamps: (KDE bug 356651). I am actively working on producing a patch for this! KIO doesn’t mount remote filesystems locally like GVFs does: (KDE bug 330192). A major architectural issue. We may need to organize a development sprint for it. You can indeed add folders to Dolphin’s places panel with the context menu! Support for hiding whole sections in Dolphin’s Places panel has already landed in master and should be released with Dolphin 18.04! Konsole tab issues were actually caused by Qt; they changed the behavior of the tab widget and we needed to adapt to that change. These kinds of issues are major pain points that get brought up over and over again in Plasma reviews and internet discussions. Fixing them has a disproportionate PR impact and generates a stupendous amount of good will. If you’re a developer, please try to hit one of these bugs sometime in the coming days or weeks! it will make a huge difference. This is how we move toward making Plasma a no-brainer choice in the Linux world. Let all go and polish Plasma to a mirror sheen! THIS is true love and commitment to KDE. You do a fantastic job! This kind of articles should be regular in kde’s dot and blog to be more close to the common user. May encourage some of them to start contributing to the project because they will feel heard. Thanks for the good vibes! That’s not a bad idea. – Um, that’s not entirely true. Gnome3 applications export a menu that is displayed in Gnome’s global panel. It’s not super extensive – one menu with a handful of items, see https://withrespectto.files.wordpress.com/2013/02/gnome-nautilus-menu.png – but it’s there and at least GTK 3.22 is LTS, therefore not a moving target. That’s something different. The GNOME 3 AppMenu is frankly pretty useless as all it has in most cases is items for Quit and Settings (though some apps expose a few more things, as you indicate). But this is talking about apps with actual menubars: File, Edit, View, etc. GNOME apps that still have those don’t export them in a way that makes them visible to the Global Menu widget, to my knowledge–though I would love to be wrong about this! You’re not wrong but notice that I used the phrase “Gnome3 applications”, not “GTK3 applications”. Gnome3 applications – i.e. 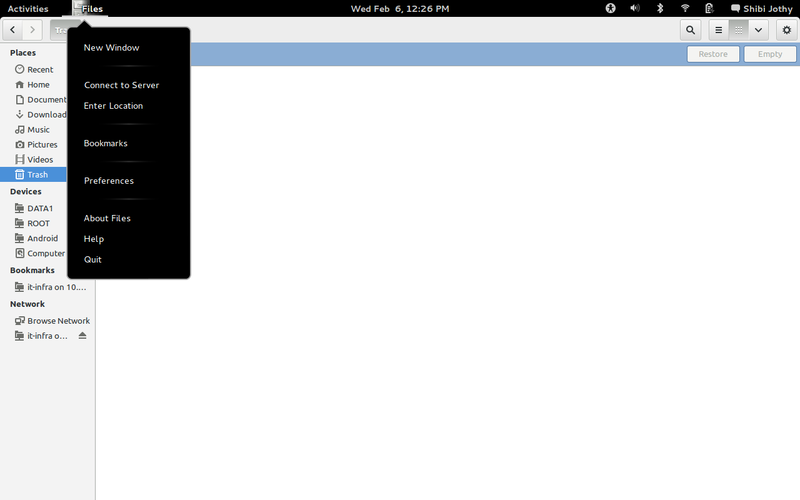 those GTK3 apps that follow the Gnome HIG – don’t have a menu bar at all, therefore missing File, Edit, View, etc. completely. Compatibility with that menu would obviously be better than nothing, right? Actually, they do still have menubars, they just don’t show up in GNOME. Try installing Gedit in KDE Plasma and turn off thre CSD; you’ll have a real menubar! Most Gnome apps don’t have the ability to turn off CSD. So what are you saying? That because there is one unmaintained Gnome text editor where CSD is optional, nobody should even attempt to implement the GTK 3.22 AppMenu? Not at all, it certainly seems better than nothing. Wow ! Just : WOW 🙂 I’m so sorry I stopped writing code 10+ years ago and cannot anymore. Who wouldn’t want to contribute to such a positive community ? Oh, by the way, the article refers to the global menu, which does work properly. But if I remember correctly, there used to be another plasmoid to also have the window controls (open / minimize / close) on a panel and automatically get rid of a window decoration for maximized windows (in the plasma 4 days) I think that is not supported anymore ? But then you partly lose the benefit of the global menu, if you have to add a top panel and cannot get some space back by removing the decoration. I know I’m probably slightly off-topic ! Tip: Make sure you get the latest version from Git if you’re going to use it. The version on KDE Look is out-of-date and doesn’t have proper (working) menu support. I’ve only recently found this blog, but since doing so I’ve subscribed via RSS and have been following it. What you’re doing is very impressive, and it makes KDE seem very attractive to me. I love what you’re doing with user feedback, especially given the kind of things that are going on with certain other projects. It makes me want to become a KDE contributor myself! Wonderful, that’s what I love to hear! There are many ways to contribute, and we’d be happy to have you on board! I love your summaries. Please continue writing these. Hi Nate! I have a suggestion: showing the download speed and details in Discover. Any chance we can prioritize/add smooth hover mouse wheel scrolling and/or momentum based scrolling to the list? Or is scrolling more of a libinput issue? I see several existing bug reports for smooth scrolling (including this one, https://bugs.kde.org/show_bug.cgi?id=76082) but they are kind of stale or app specific. Increasing the number of lines scrolled with mouse wheel produces choppy scrolling that is difficult to follow. The chromium smooth wheel scroller (https://chrome.google.com/webstore/detail/chromium-wheel-smooth-scr/khpcanbeojalbkpgpmjpdkjnkfcgfkhb) sets the bar in my book. The only KDE app (that I found) that remotely supports smooth/momentum scrolling is Discover, but smooth scrolling does not work until the scroll bar is manually dragged to a new location (i.e. select the Applications category in Discover, perform a hover scroll from the top of the list and notice scrolling is painfully slow. Drag scrollbar to a new location and immediately hover scroll and scroll speeds are much improved). Aside from capping the maximum scrolling speed, Discover’s hover scrolling is pretty close to my preferences when it works. I would like to see System Setting ->Mouse-> Scroll wheel options (similar to chromium smooth wheel scroller) for system wide momentum/acceleration hover scrolling that works for all apps including Dolphin, Kate, Widgets (Menu), Okular, etc. “Smooth scrolling”: animated transitions between scroll states when using a mouse wheel. Depending on the toolkit, this can be automatic, or manual. For example in Kirigami, I believe apps get this for free. I *think* the same is true of Qt QWidgets but I’m not 100% sure..
“Pixel/pixel-by-pixel scrolling”: scrolling using a touchpad that allows you to scroll in individual pixel increments, rather than X number of lines at a time. Same as above: apps get this for free if they use standard toolkit scrollviews, but some apps (e.g Kate, Konsole) use their own widgets and therefore do not get this for free, and would need to implement it themselves. “Momentum/inertial scrolling”: when the view continues to scroll for a bit even after your fingers have left the mouse wheel/touchpad. Prior to libinput, this could be imposed by the input driver by sending fake scroll events after actual scrolling ended, so it could work everywhere, albeit with some unsolvable bugs. With libinput, it’s all up to the GUI toolkit’s scrollview to support it, and for the app in question to turn on that feature. Yeah, some of those are already on my priority list, and I’ll look into the rest. Thanks! You should become the new PR manager for the Plasma project and KDE as a community. I am sure there are many people out there who would like to know whats going on with KDE on what for bugs of features the devs are working ob but nobody writes about it. I enjoyed the few blog posts from Kai Uwe in the past but unfortunately the last post was quite some time ago and now you jump in this gap and fill it out completely. I enjoy every of your posts and to be honest before you started your blog posts I was even thinking about something similar because I am searching Google+, KDE planet, Phab and Reddit every day to get all new features and bugfixes (and wanted to have a counter pole against “World of GNOME” ) 🙂 GNOME gets so much attention and I believe that KDE and Plasma deserve some as well but until now nobody cares except for critism what made me very sad because I really like to work with Plasma every day I use it. It’s very good that you started your work, you help the project a lot with this, please keep it up. There have already been some articles about how KDE handles criticism including one that motivated me to extend the scope of a purely personal project to have support for baloo. The article is currently only available from internet archive (https://web.archive.org/web/20160130020603/http://www.linuxveda.com/2015/09/02/phoronix-offers-criticism-kde-software-kde-deals). I believe that the KDE community spirit is geared toward this way of dealing with criticism. By the way, really nice article. > KIO doesn’t mount remote filesystems locally like GVFs does: (KDE bug 389571). – what I did not report yet, but commes to mind now that the timelinestuff, including the desktop search is missing in kde file open dialogue. Thanks, I’ll look into those! Should I try to reactivate the above mentioned https://bugs.kde.org/show_bug.cgi?id=304892 myself (if possible) or is there a reason for reopening the others, but not this. Then there is one, I am sure I filled it, but could not find in bugzilla: A gui for sorting the networks in KCM by priority. The functionality exists, but it is not really clear and easy to use. If you can confirm that https://bugs.kde.org/show_bug.cgi?id=304892 is still an issue today, then yes, please go ahead and re-open it with a (polite!) comment to that effect. I was going to investigate tonight, but feel free to beat me to it! The other two seems useful as well! Getting attention on these bugs is definitely the first step, but as you’ve no doubt notices, we’re very under-resourced. Helping to recruit more developers is probably the most important thing you can do to help right now, if you’re not up for programming yourself. Hi, nice to see a response that takes software critique seriously. I have discovered a bug that is present both in 5.8.8 and 5.11.95, this one: https://bugs.kde.org/show_bug.cgi?id=349673 What I’m wondering is, how do I mark this as affecting Plasma 5.11.95? Is is sufficient to leave a comment (which I already did)? And yes, I’m new to KDE bugtracking. A comment is fine, thanks! You did just fine. Love what you’re doing for the KDE community. Do you have any thoughts on this long-standing feature regression? I would love to see this feature back in a more accessible format..
An Idea: Put a button that opens the already existing system settings menu to install NVIDIA drivers, and another button that opens the installed package manager or in case there isn’t one installed, that leads to suggested package managers to install. I don’t know if that is already done or if not if it’s possible, but would be a nice intermediate solution. That could work. We’re currently discussing a more general solution: adding another backend that handles drivers. This would help distros out too, since they wouldn’t each need to write their own driver manager apps.